·Plush Toy Machine line adopt advanced technology from oversea and domestic. ·Some parts custom-built in order to do the trick. 5.Conveyer belt improve efficiency Easily & safety operation. Can one-time open 6D over fiber. Ideal equipment for manufacturer of stuff toy and home textiles. 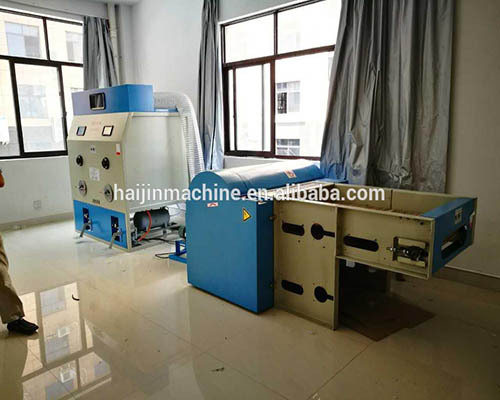 6.The automatic filling fiber machine is also called as stuffing machine. Our company develops the new stuffing machine based on technology introduction from Taiwan and South Korean. 8.which makes rag dolls, sofa, cushion and bedding appliances more fluey, softer, more flexible and more comfortable. 9.using the foot-valve to comtrol filling and stop, easy to operation. with two workers stuffing simultaneously, enhance the production capacity. Filling speed is adjustable. 10.the stuffing Tube is Changeable, with many different sizes, the customer can select filling tubes according to their own needs. 11.The machine has clear apperance and assembled very hermetcally. so there will be safe and sanitary. 12.there should be one air compressor to provide tue air pressure to the main stuffer. So that the material can be below out and stuff into the tou skins easily. 13.Through the small window you can see the inner of the machine working condition. 14.The material must be opened already or ball fiber materials.